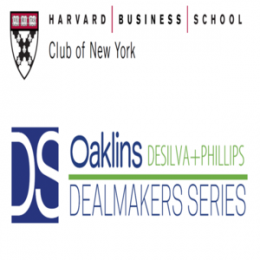 Oaklins DeSilva+Phillips brings dealmakers together to encourage new connections and opportunities. We regularly host events called the Dealmakers Series which are topical, invitation-only discussions for the top dealmakers and operators in our markets. Our events always approach the discussion through the lens of M&A. They feature industry experts discussing the future of the media and technology industries, specifically focusing on recent and imminent notable transactions, as well as emerging trends and opportunities in our space. Oaklins DeSilva+Phillips’ professionals are also frequently asked to speak at events, or are attendees themselves. In all instances, we encourage you to seek us out at the events listed below and meet us in person. On September 25, ODP hosted the Dealmakers Future of Higher Education Summit. One June 21st, ODP hosted the Dealmakers Blockchain Summit. Tom Glocer, Former CEO of Thomson Reuters, on "Investing in FinTech & the Digital Future"
The Standard, High Line, 848 Washington St.